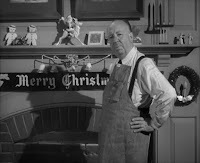 “What is drama but life with the dull bits cut out.” – Alfred Hitchcock. PlayGround-LA continues its fourth season and celebrated monthly staged reading series, Monday Night PlayGround, on December 14 at the Zephyr Theatre with six original short plays inspired by this month’s topic… A VERY MERRY HITCHCOCK CHRISTMAS. Los Angeles-based playwrights in the PlayGround-LA Writers Pool have four-and-a-half days to write and submit scripts inspired by the topic. The six finalists will be presented as script-in-hand staged readings at 8pm on December 14. For tickets, low-cost flex passes or for more information, the public can call (323) 992-6766 or go online at http://PlayGround-LA.org/monday. Ten days before the designated Monday, a topic is announced and the thirty-six playwrights in the PlayGround-LA Writers Pool have until 2pm the following Tuesday to submit a short script. A panel of judges selects six winners, whose entries are cast over the weekend and then rehearsed with the area’s best professional actors and directors in a whirlwind ninety minutes each before being performed as script-in-hand staged readings. Previous topics include “Origin Story”, “Sea-Change”, “Holiday Spirit”, “I Have A Dream...”, and last month’s “Presidential”. PlayGround-LA is the first regional expansion of the celebrated Bay Area playwright incubator and theatre community hub, PlayGround(SF). PlayGround was launched in San Francisco in 1994 by co-founders Jim Kleinmann, Brighde Mullins and Denise Shama. In 1996, Kleinmann became PlayGround’s first Artistic Director. Since its founding, PlayGround has developed and staged over 750 original ten-minute plays by 250 Bay Area and Los Angeles early-career writers and has commissioned/developed 60 full-length plays by distinguished PlayGround alumni. In the process of staging those works, PlayGround has helped to identify some of the leading emerging writers and, at the same time, has engendered the creation of a true community of theatre artists, bringing together hundreds of local actors, directors and playwrights. For most if not all of the participating writers, PlayGround is the first professional staging their work has received and serves as their introduction into the professional theatre community. PlayGround and PlayGround-LA’s alumni have gone on to win local, national and international honors for their short and full-length work, including recognition at the Humana Festival, Sundance Festival, Bay Area Playwrights Festival, New York International Fringe Festival, Aurora Theatre Company’s Global Age Project, and Samuel French Off-Off Broadway Short Play Festival, among others. Directors and actors participating in PlayGround are among some of the most distinguished theatre professionals, regularly working on leading local stages. ADVANCE TICKETS: $20, priority seating; $15, general admission; $10, student admission with ID. $20 general admission tickets at the door beginning one hour before the performance, subject to availability. 4-admission priority-seating flex passes are $60.